After more than twenty years, this extra strong formula is one of the best sellers ever! Millions of bottles of Ram have been sold all around the world. Pure and powerful. 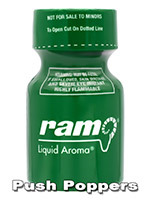 Look for Ram in the popular "Green Bottle".